There are so many things to do in the Scottish Borders, it’s a wonder the area is still relatively undiscovered when it comes to tourism. Most visitors to Scotland head north, making a bee-line for the Highlands and Islands to snap up their cow selfies, or over to Edinburgh to gawp at the bagpipe buskers and try on kilts. Yet we’ve been guilty of the same, and have lost count of the number of times we’ve driven north without a thought to the area we were passing through. 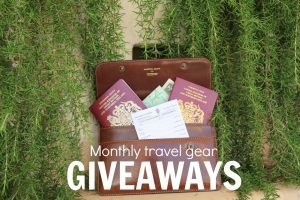 That all changed this month when we spent a week exploring some of the best things to do in the Scottish Borders, and boy did we enjoy it. There were no crowds, bagpipes or selfie sticks. Instead we found a land rich in heritage, surrounded by gently undulating countryside that still retained that unique and gloriously hardy Scottish ‘edge’, despite being so close to England. 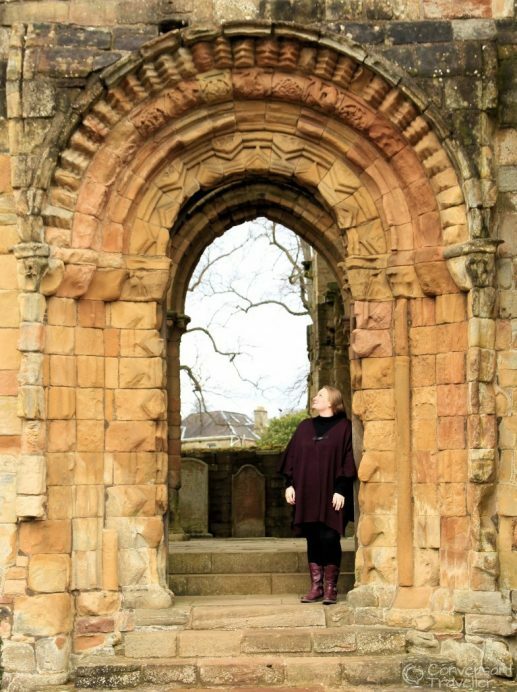 We could easily have spent a couple of weeks in the Scottish Borders, discovering ancient abbey ruins, visiting castles and stately homes, and eating all the haggis bonbons. 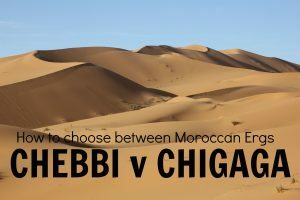 I almost don’t want to tell you about it because I would hate for the the Borders to fall prey to mass tourism in the future (not that I’m going to single-handedly do that by writing this blog post!). However it’s a place that deserves to be shouted about. With so much to offer even the first-time visitor to Scotland, the Borders area is undoubtedly going to become the next big ‘discovery’ on the country’s tourism trail, and I’m thrilled that we were here near the beginning. 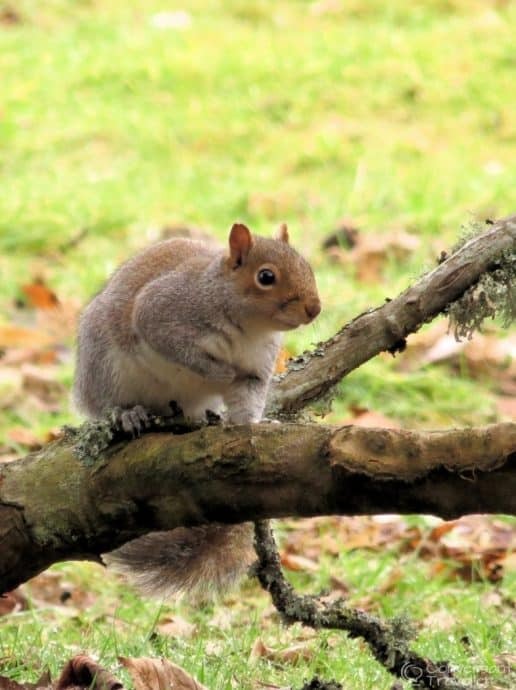 This is quite a long post (because there are so many things to do in the Scottish Borders) so grab a cuppa and a handful of your favourite biscuits (I’m a chocolate hobnob girl myself) and read on. Hubbie and I love crumbling old ruins, and were in seventh heaven clambering around all the historic sites up here. Paradise for us doesn’t mean palm trees and sandy swathes. A bit of moss-covered ancient rock and tall towers with far-reaching views will do us just fine. There are 4 Borders Abbeys, all quite close together and easily seen in a day or two combined with other attractions. One of our favourite places to visit in the Scottish Borders has to be Jedburgh Abbey, still magnificent 9 centuries after its foundations were laid by David I. Despite being frequently targeted by armies from across the border, Jedburgh Abbey remains impressively in tact, and worthy of any Instagram feed if that’s your thing. There’s also an aromatic herb garden, small visitor centre and stone display to explore. Top Tip: at the west end of the nave there’s a tiny spiral staircase which leads up to a balcony on the first floor giving superb views of the entire building. Most Brits will have heard of Sir Walter Scott. He’s the chap who famously wrote Ivanhoe and Rob Roy, and was one of the most popular 19th Century writers in Britain. Growing up in Edinburgh and the Scottish Borders, Scott set many of his ballads, poems and novels in the local area, the success of which allowed him to build a magnificent estate on the banks of the River Tweed which further added to his creative inspiration. 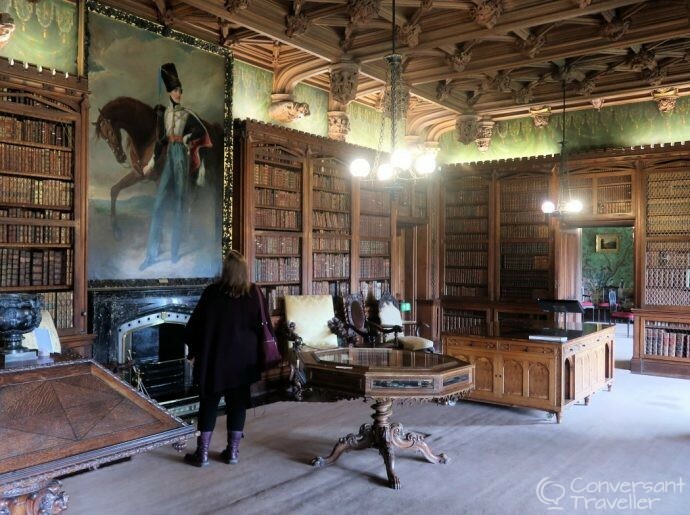 Abbotsford House is open to visitors and one of the most popular things to do in the Scottish Borders. It’s well worth a visit, even if literature isn’t really your cup of tea. The library is simply stunning, and it’s the sort of place that will have you coming away wanting to redesign your own home. Even if you don’t have 120 acres to play with. Top Tip: there are 2 different audio guides available, one which is factual, and one which is narrated by an actor (complete with lilting Scottish accent) pretending to be Scott himself showing you around his house. We tried them both (typically Hubbie made me take the theatrical version) but on balance preferred the factual one as it was sometimes difficult to sift through the drama and actually understand what the rooms were all about on the other guide. Plus there were dogs barking for effect on mine, which is never a good idea. I don’t do dogs. Scotts View is really easy to get to by car. Just take the B6404 between St Boswells and Kelso then turn onto the smaller B6356. The viewpoint is just a few miles along this road and offers one of the best, and most famous, panoramas in the Scottish Borders. Overlooking the River Tweed and the iconic Eildon Hills, this was apparently a favourite spot of Sir Walter Scott to come and contemplate life and look for inspiration for his novels. It’s a great place for a picnic on a sunny day, which I’m assured does sometimes occur in Scotland! Top Tip: just before you get to Scotts View there’s a tiny car park and a short walk which leads to an enormous William Wallace Monument. It also makes sense to combine a visit to Scotts View with Dryburgh Abbey (no. 12 below! ), which is just down the road. Visiting the Scottish Borders isn’t just about heritage and good views. It’s also about having fun, and there was one activity which topped this list with ease. Tomahawk throwing! You know, just your average day out, with added axes. I was a little apprehensive before we arrived, but not because I was scared of the weapons. I just knew I’d be useless whilst Hubbie would be flinging things left, right and centre, and hitting the target every time. That’s pretty much how it happened. Yet instead of feeling stupid, I absolutely loved it and hadn’t had that much fun in ages. 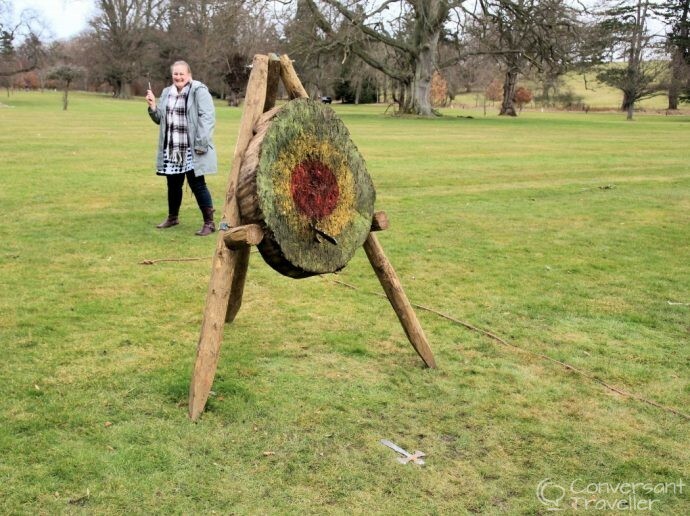 Tutor Tracy from the Roxburghe Shooting School expertly put us through our paces in the beautiful grounds of the Roxburghe Hotel and Golf Course near Kelso (where we later had afternoon tea). She had patience and enthusiasm in equal measures and before long even I was hitting the reds. So proud of myself and it definitely, almost certainly, well hopefully, wasn’t down to just a bit of luck. We used two types of axe. The smaller girlie ones were called ‘angels’ and in theory should have been easier to strike with seeing as they had 4 points. However they required a lot of power behind the throw because they were pretty light, and I found the action more natural with the heavier axes. Hubbie of course picked it up almost immediately, which is reassuring should we ever have to defend ourselves from other tomahawk wielding warriors. Hands down the best thing we did in the Scottish Borders! Top Tip: the shooting school also offers a range of other country sports such as archery, clay pigeon shooting and fly fishing, all your quintessential Scottish pursuits! We’re huge fans of afternoon tea (because after all, who doesn’t love cake! ), and never miss an opportunity to indulge when we’re on holiday. There are lots of establishments across the Scottish Borders who offer this quintessential mid-afternoon experience, but we decided to try the Roxburghe Hotel near Kelso since it had roaring log fires and a few yummy local twists. 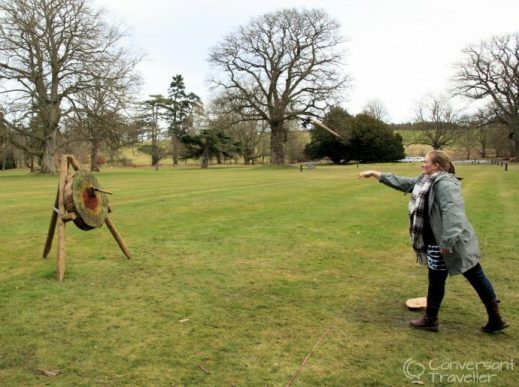 It was also where we did the tomahawk throwing, and thought the two would work well together. They did! Top Tip: combine your afternoon tea with a session at the shooting school for a truly memorable day out in the Scottish Borders. Or if you’re into golf, head over to the Roxburghe Golf course for a few rounds. Another abbey, this time below the Eildon Hills in the pretty town of Melrose. Probably the most famous ruin in all of Scotland, it was once loved by Robert the Bruce himself, and the chapter house was chosen as the final resting place for his heart. As with all the Border Abbeys, Melrose was subjected to attacks by the English during the Middle Ages yet the ruins today still give a good idea of what life would have been like for the monks who lived here until 1590. 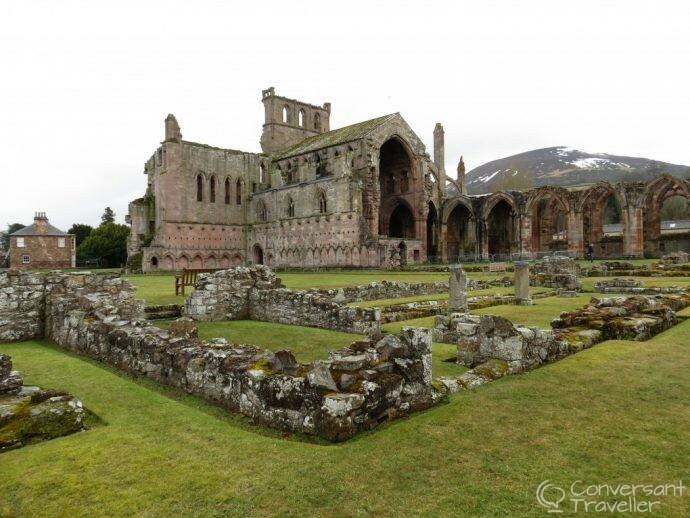 To see a fascinating collection of medieval artefacts which were found in the cloister at Melrose Abbey head over to the Commendator’s House Museum which is just outside the abbey grounds. Most people consider Melrose Abbey one of the top things to do in the Scottish Borders, but we have to admit we preferred Jedburgh. However the views here at Melrose are really superb so make sure you climb to the top of the bell tower for a gorgeous panorama out across the surrounding countryside. Top Tip: keep an eye out for the famous bagpipe-playing pig gargoyle! I’d had my eye on Dalhousie Castle for years, and visiting the Scottish Borders seemed the ideal time to finally check it out. I was worried we’d be disappointed, thanks to the weight of expectation that had built up over the last decade, but thankfully that wasn’t the case. Dalhousie Castle and Aqueous Spa (to give it it’s full title!) is on the banks of the River Esk, just 8 miles south of Edinburgh, and famous for being the oldest inhabited castle in Scotland. Only a little fearful of ghosts in a place that has survived war and intrigue, we figured that somewhere with a guest list that has included Edward I, Queen Victoria and of course our friend Sir Walter Scott, would be worth the risk. Instead of apparitions we found indulgent suites and world-class dining, all without the usual whiff of pretension that so often comes with such a place. Oliver Cromwell used the castle as a base from which to invade Scotland during the Civil War, and being a bit of a 17th century history nerd I was delighted to find we’d be sleeping in the Cromwell Room with it’s modern 4-poster bed and seductive lighting. But perhaps the best bit was the Dungeon Restaurant, complete with candlelight, suits of armour and food that more than lived up to its reputation. Top tip: if you want to eat in the dungeon restaurant make sure you book ahead as it’s understandably very popular. Falconry isn’t only a sport, it’s also an art and part of Scotland’s ancient heritage. Historically, hawking was a past-time usually undertaken by the nobility, but today anyone can have a go and it’s one of the most popular things to do in the Scottish Borders. We booked a session with Falconry Scotland who are based in the grounds of Dalhousie Castle up near Edinburgh. It was our first time trying falconry, so we opted for the 45 minute Raptor Experience where we flew a Harris Hawk called Iona in the grounds in front of the castle, and also got to hold a lovely Eagle that made me realise I need to get to the gym more. She was very heavy on the arm! Hubbie of course was a natural. It was a lot of fun, and definitely something we’d do again, but we did feel it was rather expensive. It cost £40 per person for a group session, for what was essentially a bit of a talk (albeit very interesting!) and the chance to have a bird land on our arms about 6 times each. We had been hoping to walk through the castle grounds with the bird swooping down from all directions, but actually we were just standing a few metres away from the bird enclosure, with the hawk using the same couple of trees from which to approach us. Perhaps we’ve seen too many nature programmes and had set our expectations too high. Having said that, if you can afford it I do recommend giving it a go. It’s definitely one of those iconic Scottish Borders experiences that isn’t something you’ll forget in a hurry. Top Tip: Falconry at Dalhousie Castle is by appointment only, so don’t just turn up hoping for a session, make sure you book in advance. The Scottish Borders are peppered with medieval peel towers, dating back to the days when families and clans had to protect themselves from marauding cattle raiders. The ground here was never suitable for arable farming so the people who resided here depended on raising livestock which was the currency of these lawless lands, and perhaps understandably many inhabitants turned to cattle rustling in order to survive. The peel towers were built both as strongholds for wealthier families and to protect their most prized livestock. Today many of these peel towers are still standing. Some have been restored as historical places of interest, some are crumbling ruins that just add to the romance of the region, whilst others have been fully renovated and turned into houses or tourist accommodation. One of the most accessible peel towers to visit is Smailholm, perched on a rocky crag half way between Melrose and Kelso. The minor road is rough and muddy in places as it crosses through farmland, but it’s not a problem in a normal car. There’s a short steep climb up to the tower (which only takes 5 minutes) and during the summer months it’s possible to look inside. We visited during winter so made do with the rather spectacular views from outside. Top tip: you might want to bring sturdy hiking shoes or even wellies if it’s been raining, it was quite boggy when we were there in March. Another popular peel tower is the brilliantly named Fatlips Castle, which we didn’t have time to explore but having seen it from the road have put it at the top of our list for next time. You can pick up the key from the garage in Denholm and have a look inside once you’ve climbed up the hill. Definitely a mini adventure worth considering. If you’ve ever read Dan Brown’s book ‘The Da Vinci Code’ you’ll know all about the Rosslyn Chapel. Built in 1446 as a place of worship, the chapel is still used today for services, as well as being a popular visitor attraction in the Edinburgh area. Guides do information talks every hour inside the chapel, which are well worth listening to as there is just so much to take in. Nearly everything you come across has an intriguing story behind it, with or without the influence of Tom Hanks! Top tip: photography isn’t allowed inside the chapel but you can snap away to your hearts content in the grounds outside. 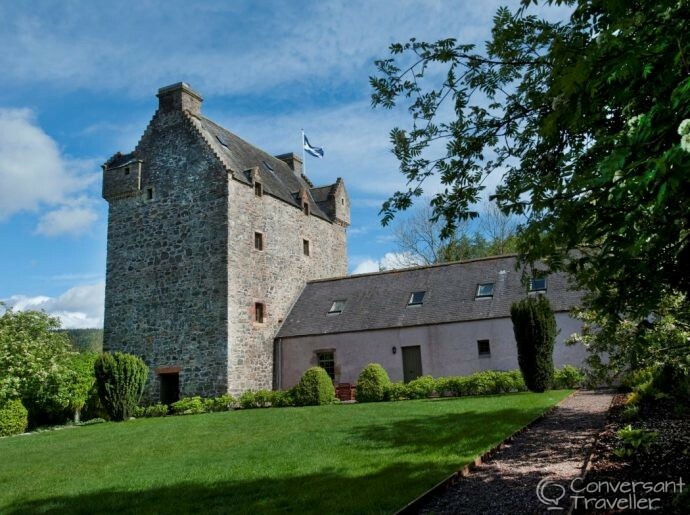 Whilst visiting the Scottish Borders we also stayed at Aikwood Tower, a stunning 500 year old peel tower which is now a luxury self-catering hideaway in the Ettrick Valley. The tower is little changed since its days as a stronghold, although the interior is rather more luxurious than it would have been in the 16th century. This peel tower is an astonishing combination of contemporary elegance and medieval memory, with opulent bed chambers and roll top baths alongside a spiral stone staircase and a great hall complete with ancient fireplace and lofty ceilings. 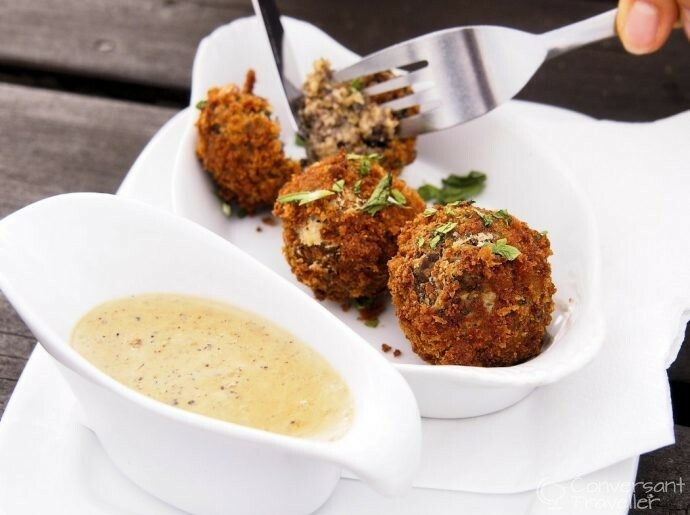 It’s the perfect base for a group of friends or family to experience all the best things to do in the Scottish Borders. 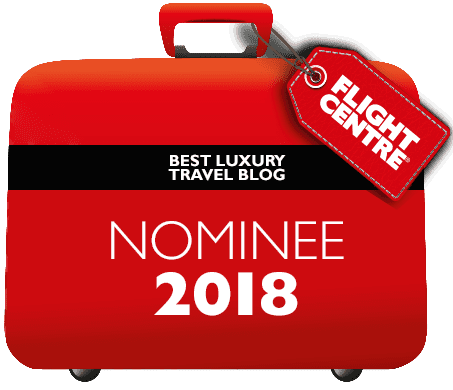 Although there are 4 abbeys in the Scottish Borders, we decided to just visit 3, because you can perhaps have too much of a good thing after all. Our third was Dryburgh Abbey, and we actually preferred it to Melrose, which although pretty impressive structurally, was in a town. 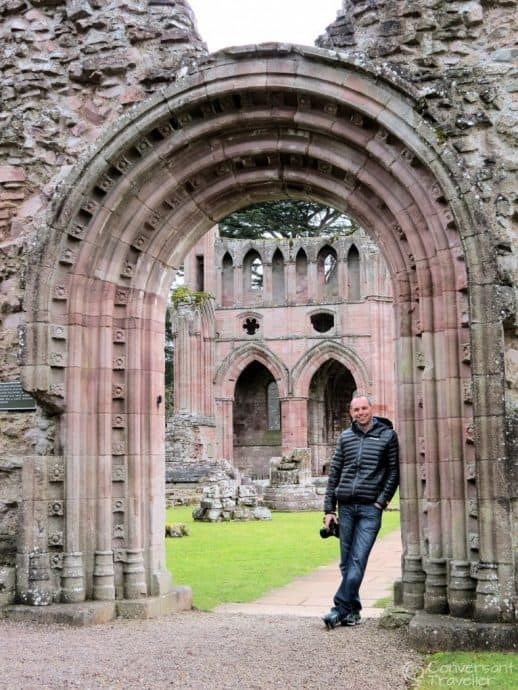 Dryburgh Abbey has to be one of the most peaceful places we’ve ever explored, and one of our favourite things to do in the Scottish Borders. Hidden away down on the banks of the River Tweed, it exists in a quietly secluded little world of its own, with just the spirits of medieval monks and the local wildlife for company. What sets Dryburgh Abbey apart as one of the most fascinating places to visit in the Scottish Borders is the chapter house and monastic quarters which are remarkably complete. You can even see the paintwork inside which dates back to when the abbey was first built. This is also where Sir Walter Scott is buried, a fitting place for one who loved the area so much. Top tip: take a walk down to the river below the abbey and see if you can spot an otter. They’re quite common here and we spent a happy half hour watching one playing in the water. Magical. Over on the coast between North Berwick and Edinburgh, Tantallon Castle is the stuff of fairytales. Perched dramatically on the edge of some rather foreboding looking cliffs, Tantallon was the stronghold of the powerful Douglas family, who were often at odds with the Crown. Overlooking Bass Rock (famous for its gannet colony), the castle was put under siege by James IV and James V, but it wasn’t until Oliver Cromwell invaded in 1651 that the castle was finally destroyed. What remains today is a haunting reminder of the unsettled times the Scottish Borders have seen over the centuries. It was a grey drizzly day when we visited and I was a bit gutted not to snap that perfect blue sky shot, but actually the weather just added to the moody atmosphere and made the experience all the more embracing. Top tip: this is another place that gets rather muddy in wet weather and since the castle is a short walk from the car park it’s best not to come in your high heels. A lot of the bigger attractions in the Scottish Borders are closed to visitors over the winter, which is a real shame for those of us who love travelling outside of the main season. Thankfully there was still plenty for us to see, but unfortunately Floors Castle wasn’t one of them. Famed for being Scotland’s largest inhabited castle and built in the 18th century for the 1st Duke of Roxburghe, it’s one of the main attractions in the Scottish Borders and a place we hope to visit on our next trip. Still a family home, Floors Castle boasts a splendid collection of grand rooms, tapestries and fine art, and the views of the River Tweed and Cheviot Hills are stunning. The grounds are gorgeous and ideal for an afternoon woodland or riverside stroll before popping into the terrace cafe for a slice of cake. We’re not massive fans of stately homes, but Traquair House definitely deserves a couple of hours of your time. It’s the oldest inhabited house in Scotland and back in ye olde times was a pleasure park for Scottish royalty, as well as being a refuge for Catholic priests escaping persecution. The Traquair Stuart family were prominent supporters of the Jacobite cause, and Mary Queen of Scots. Today the house is little changed and open to the public, and has a superb collection of relics and letters from the past. The grounds and woodlands are idyllic for a summer stroll, and there’s a cottage restaurant serving food throughout the day. It's beginning to look a lot like Christmas! Free Christmas opening at Traquair- this weekend: 26th and 27th November 10.30am to 4pm. Come along and join us. Top tip: There’s also an award-winning brewery at Traquair House, so if you’re into traditional Scottish ales, this is the place to go. Formed by volcanoes, St Abbs Head is the most famous landmark on the beautiful Berwickshire coastline, just north of the border with England. This dramatic headland with plunging cliffs, offshore stacks, carpets of wildflowers and crystal clear waters is home to a spectacular colony of seabirds and you can see them up close from several vantage points along the cliff-top. It’s a fantastic place for birdwatchers, hikers and natures lovers to explore, and feels much more wild and remote than it actually is. Another site that doesn’t open over winter is the eerie and isolated ruin of the 14th century Hermitage Castle in Liddesdale near Hawick. You can however walk up to it, but if you want to explore inside it usually opens around Easter time. Hermitage Castle has a particularly intriguing history full of treason, murder and even romantic trysts, and is known as ‘the guardhouse of the bloodiest valley in Britain’ thanks to its role in controlling the Anglo-Scottish border during the Middle Ages. On a less gruesome note, Mary Queen of Scots used to meet her lover, the 4th Earl of Bothwell, at Hermitage Castle, and Sir Walter Scott was also a fan of the site. Top tip: even if the castle isn’t open during your visit, you can still enjoy a good view from the road. For even more inspiration about things to do in the Scottish Borders, check out the Visit Scotland website to help plan your stay. Dalhousie Castle – it was such a treat staying in the oldest inhabited castle in Scotland, and despite its age the castle was incredibly luxurious inside. There are several different suites with 4-poster beds and a rather unique underground dungeon restaurant where you dine by candlelight beneath suits of armour. Cringletie House – a beautiful 19th century country castle house with 28 acres of gardens that offers affordable luxury just 18 miles south of Edinburgh. Aikwood Tower – one of our favourite hideaways to date, Aikwood Tower is a Medieval peel tower just outside Selkirk perfect for special occasions, stag or hen parties, and friends and family get togethers. Roulotte Retreat – quirky and romantic French-crafted gypsy caravans near the Eildon Hills in the heart of the Scottish Borders, featuring exotic interiors inspired from travels around the world. 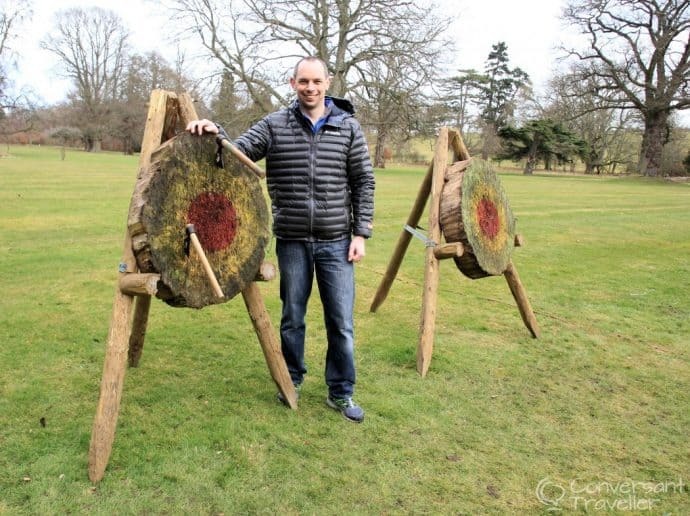 Roxburghe Hotel and Golf Course – this is where we had afternoon tea and did our tomahawk throwing. The hotel is a splendid old building filled with comfortable antique furniture, roaring log fires and a good dose of traditional Scottish decor. 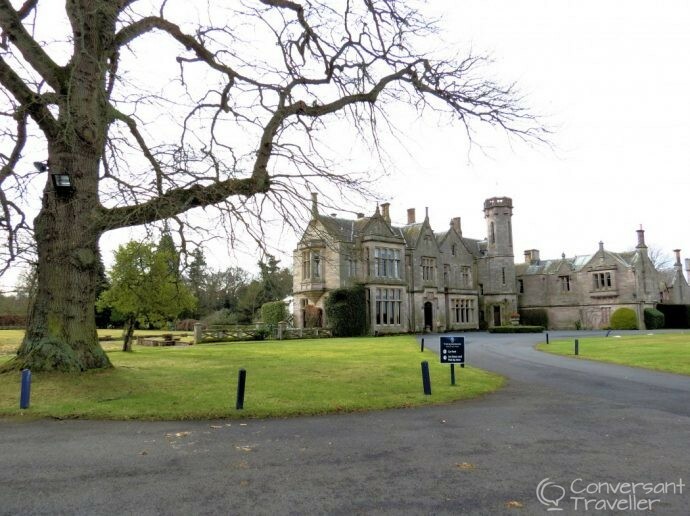 Dryburgh Abbey Hotel – set on a tranquil and secluded 10 acre private estate right next to the beautiful Dryburgh Abbey and River Tweed, the Dryburgh Abbey Hotel has large bedrooms, a swimming pool and an enviable location. Kingsmuir House – an award-winning luxurious guest house near Peebles with friendly hosts, scrummy Scottish breakfasts and a tasteful interior that nods to the traditional whilst keeping things comfortably modern. The Barn at the Coach House – just a 13 minute walk from Melrose Abbey, this cute B&B is well presented with ensuite rooms, a sun terrace and an excellent central location from which to explore the Scottish Borders. Thanks to Visit Scotland for providing us with Media Passes to discover the best things to do in the Scottish Borders. All words and opinions remain our own, and we never accept complimentary entrances unless we’d have been prepared to pay for them ourselves. Wonderful post. I bought my boyfriend a spa day in Dalhousie Castle, with an afternoon tea on top. Wonderful visit. As is the case with afternoon tea, we left feeling satisfied but extremely full. If you’re in that area, a trip to Rosslyn chapel is a great addition too. A day spa there sounds good, we’ll have to try that next time! We did visit Rosslyn a few years ago, great tip, will have to add it, thanks Andrew! Stunning pics (worthy of watercolour paintings) of my favourite places in the Scottish Borders, Thank you for the re-visits and info on those visits still to come. I may just have to dig out my watercolours again, though tend to be much better with the camera these days 🙂 Thanks for stopping by, glad it brought back some memories, such a stunning area with an intriguing history! What a lovely article and some beautiful photographs of our amazing Scottish Borders. Next time you are in the area why not book a stay at Airhouses? 5 Star luxury with your own hot tub, stunning views of lots of animals to befriend. Oh boy, lots of things to do in Scotland that don’t involve wearing a kilt. I hate the captcha too, trying to sort a new one!